Upon walking into the office of the Marian Goodman Gallery in Paris, one faces a very large digital print, literally nailed to the wall. A large brown metal oval shape seems to have landed over the ruins of a city. The contrast is striking between the two halves of the image. The top part tells us about modern architecture, about a move forward in economic development, whereas the bottom half is about decay and destruction -natural or man made-. What is striking is the difference in “human effort”: whatever energy –and budget- has been spent to build the new and modernistic building had clearly not been put into maintaining and developing what has turned to rumble at the bottom. 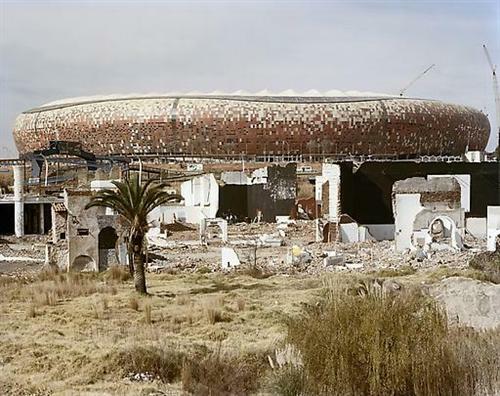 This image is entitled “The FNB Soccer City stadium built for the World Cup of July 2010, and the ruins of Shareworld which was built and went Bankrupt in the 1980s. Shareworld was intended as a theme park for the citizens of Soweto. 6 June 2009”. It is one of David Goldblatt’s recent large (95,5x125cm) color cityscapes that he has been producing for the last 6 or 7 years. It is interesting to notice how both buildings (or what’s left of them) are essentially of the same nature: entertainment venues for the masses, built 40 years apart from one another. In the first case aimed at a world wide population gathered in South Africa (or in front of their TVs) for the soccer world cup of 2010, in the second case aimed only at the black population of the Soweto ghetto. In his sturdy walking shoes, and his multipocket pair of pants, David Golblatt seems geared up to go pacing the red earth of his country, South Africa, and not strolling the premises of his own exhibition in Paris. Yet, as soon as he addresses you, he is fully dedicated to the conversation, concentrated on the questions and careful to answer them as best and precisely as he can, his pale and focused blue eyes locked on yours. This 80 year old gentleman is the embodiment of elegance and charm. This 80 year old photographer is as sharp and active as any of his 50 years younger colleagues. As illustrated by his most recent project, which he began only last summer, called “Ex offenders”, where one can see an echo of Taryn Simon’s “Innocents”. Shown for the first time on the walls of the Fondation Cartier-Bresson in Paris, this project addresses his country’s main and constant problem: violent crime. It consists of a series of black and white portraits, each accompanied by a short text, summarizing the subject’s life. Each person has served a prison sentence (from a few months to a couple of decades), and is now taken back to the very location of the crime to be photographed. The images are quite simple and straightforward. They do not give a lot of story to decipher on their own. But they are not the whole project. As with many of Goldblatt’s images –and projects-, the text is an essential part of the message. The project manages to stay clear of stereotypes and keeps its interpretation open for the viewer. “That’s the way I like my images to work. If the meaning is imposed to the viewer, then it is not as rich”, says the photographer. There are a few white people in the project, which actually opens on the portrait of a white security guard, Hennie Gerber, sentenced for the murder of a black person. There are some redemption stories, as well as stories with no remorse and stories with a bad ending. It feels like he is indeed addressing “violent crime” under its many aspects, not narrowing the issue to just one section of society, or one type of storyline. His economy of means is not to be confused with simplicity. On the contrary, the minimal and non spectacular photography of David Goldblatt lay all the interpretation work on the viewer’s shoulders. He is excepting us to be careful and intelligent spectators of the stories we are being told. Sometimes the captions will lead us into paying attention to a small detail we might have otherwise overlooked (a mother and her baby, or one specific road sign). 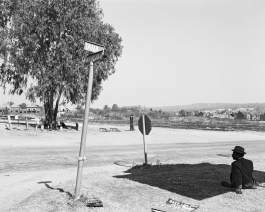 For that reason, even if he denies liking it, David Goldblatt has always written about his own photography, perhaps to make sure the viewer had enough keys to make an interpretation of the images. The access to power of the National Party, and its setting up of the legal racist system called Apartheid led Goldblatt -a Jew- and his wife to consider leaving the country. 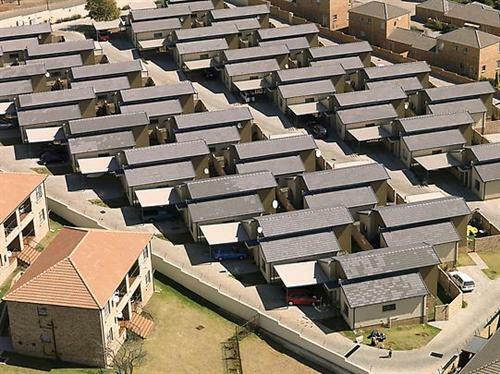 “We decided to stay, and bought a house in Johannesburg, where we’ve remained to this day. Because I realized I had no interest in anything else than exploring, understanding, probing my country.” And that is the agenda he has kept since then. For no matter what photographic forms his project might take, they seem to all address similar questions of identity, and the relation between the person and their location, between land and the possibility of identity. Where people live (In Boksburg, 1982), where they work (The transported of KwaNdebele, 1989), where they are incarcerated (Punishment cells, 2000), where they commerce and interact (Intersections, 2005), and it feels that his latest book encompasses all those aspects with one geographic common denominator, Johannesburg. 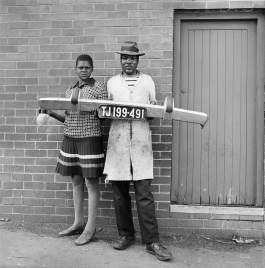 TJ (Transvaal Johannesburg), as stated on the old car plates) is both Goldblatt’s new book, and the core of his Fondation Cartier-Bresson exhibition. Not a chronological compilation of images, but rather of cross section of the photographers’ themes, styles and projects with this city as a background. It is amazing how he renews his concepts -and obviously his photographic style- while constantly working the same material. 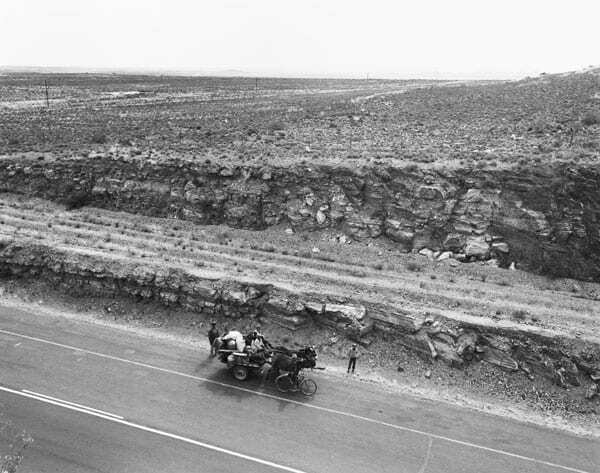 The earliest images would fall into the documentary tradition of photography, with many classical black and white street scenes. That is the only section of the exhibition where we can see one image which includes black and white people in the same frame. “Children at the frontier between Pageview (Fietas) and Mayfair. April 1952”, was made only 4 years after the implementation of Apartheid, and… is an image of kids playing. 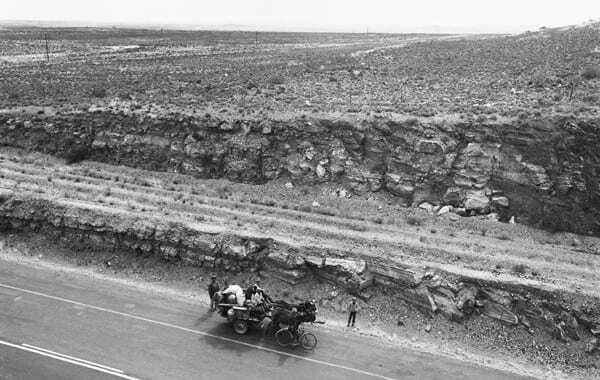 There are whites and blacks in other images, but either separately, or with an indication of class hierarchy: “A farmer’s son and his nursemaid, Heimweeberg, Marico Bushweld, Transvaal, 1964” or “Meeting of the worker-management Liaison Committee of the Colgate-Palmolive Company, Boksburg, Transvaal, 10 July 1980”. Maybe M. Goldblatt did some images for the magazines that were more news oriented, more obviously illustrating the racial barriers than the projects exhibited here, but he is not interested in exploiting his archives of commissioned works. Perhaps like Henri Cartier-Bresson, he believes that the trash goes to the magazines, whereas the good images are kept for books and exhibitions…. 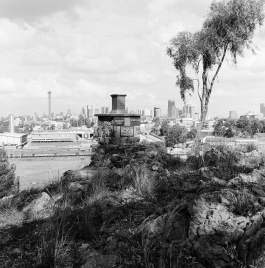 The second floor of the Fondation exhibition could very well be a group show of different photographers, all dealing with aspects of modern day Johannesburg. The visitor will see in the same room: the black and white portraits of the “Ex Offenders”, the cold and evocative urban landscapes of the “Intersection” series, as well as areal images of both old shantytowns and newly built housing projects (both shot from helicopter with a digital Hasselblad), and finally the frightful yet conceptual series of 27 interior shots of “Punishment cells” of an all black prison facility, photographed in vertical color landscape format with a systematic frame that will draw the viewer to the gruesome details of each closet sized “cell” (not unlike Donovan Wyllie’s treatment of prison rooms of “The Maze” prison in Ireland). The concepts seem to be what drives M. Goldblatt’s projects, and what will determine their form. 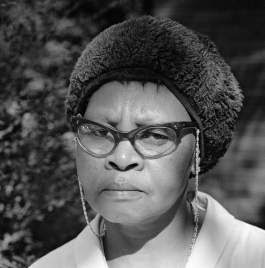 He used black and white for all of the Apartheid period, because “some things are too hard and difficult to be photographed in color”. He has moved from his initial 35 mm camera to a view camera (which he first started using on assignment in Soweto: he found out he couldn’t be faster that the kids that swarmed him, so decided to be slower and outlast their patience). Then moved to digital photography (first on the printing side, and then on the shooting side as well, for some projects). And none of those technical choices seem to matter, they are only tools to serve the message he wants to convey to the viewer. 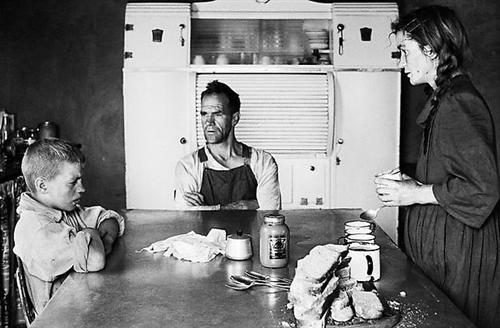 In the end the consistency of David Goldblatt’s photographic style comes from the consistency of his thought process, of his untiring questioning of the South African society in its different stages of evolution through the last 60 years, and not from a visual signature. This shows how open, curious and avid this young author of 80 is. Let us keep an eye out for all his upcoming ideas and projects. 2, impasse Lebouis, 75014 Paris. All images © copyright the photographer and/or publisher, All text © Baptiste Lignel and ASX. All rights reserved. 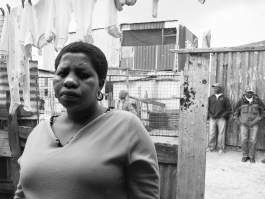 Posted in Documentary, Reviews and tagged ASX.Paris, David Goldblatt, Essay D, Exhibition Review, France.